The Indira Gandhi National Park and Sanctuary formerly known as the Anamalai Wildlife Sanctuary lies in the Coimbatore District of Tamil Nadu at the southern part of the Nilgiri Biosphere Reserve in the Anamalai Hills. Named after the late Prime Minister Smt Indira Gandhi, it is an ecological paradise covering an area of 958 sq.kms. The wildlife sanctuary includes a National Park also. It was notified as a sanctuary in the year 1974 and 108 sq.kms of its unique habitats at 3 places - Karian Shola, Grass hills, Manjampatty were notified as National Parks in 1989. The Sanctuary declared as a Tiger Reserve in April 2008. The National Park, with its main tourist zone known as Top Slip, has an altitude varying from 350m to 2,400 metres above sea level. It has an excellent variety of flora as well as fauna. The terrain consists of thickly wooded hills, rolling grasslands, plateaus and deep valleys. It has an annual rainfall between 500 mm to 5000 mm. The vegetation that covers most of the park is of the mixed deciduous variety. There are rich evergreen and semi -evergreen forests. The semi-evergreen and the wet temperate habitat of this park contain teak, rose wood and many miscellaneous tropical species. The park comprises of around 8,000 species of plants. Some of the rare and endangered species of flora, which are found in the Park are Combretum Ovalifolium, Dispyros nilagrica, Gymnopteris Contaimirans, Habebarai Reriflora, Polypodum Pleroupus, Alsophila, Bulbophyllum sp, Lasianthus uenuloses, Angiopterris Erectra, Gnetum Ula, Impaliens Elegans, Lycopodium cernum, Ranunculus Reniformis and Osmunda Regulis. Trees have placards with their botanical names and other details. The animal population of this park is equally diverse as the flora. It has some of the more fierce and aggressive creatures like Tigers, Panthers, Wild Boar, Sloth Boar etc. Elephants, Pangolin, Sambar, Barking Deer, Mouse Deer, Spotted deer, Nilgiris Tahr, Civet Cat etc. are found in large numbers. Arboreal animals, like the rare Lion-tailed macaque, Bonnet macaque, Common langur, Nilgiris langur, Malabar giant squirrel and Grizzled giant squirrel are also found in the park. Around 500 species of birds, including resident and migratory birds are found in the park. Species of birds include Cormorants, Quails, Hornbills, Orioles, Storks, Eagles and Owls. Some of them are Racket Tailed Drongo, Wynad laughing thrush, Black Headed Oriole, Paradise Flycatcher, Whistling Thrust, Emerald Dove, Green Pigeon, Tickell's Flower Pecker, Rufus Wood Pecker, Rose Ringed Parakeet, Black Eagle, Great Indian Malabar Pied Horn Bill, Fiary Blue Bird, Green Billed Malkhoha etc. Top Slip is the main birding area. There is a watch tower overlooking a reservoir around 1km from the edge of the Karian Shola on Top Slip. Many of the birds can be seen on the way as well as from the watch tower. Motor vehicles and elephants for riding are available on hire. Trekking is allowed inside the park accompanied by a park guide. 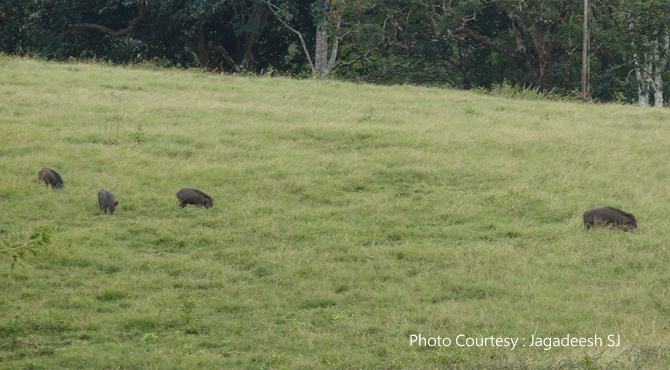 There are possibilities of sightings of giant squirrels, deer, bisons, hornbills, elephants etc. The park is open from 6 am to 6 pm for visitors. Entry Fee : below five years - Free, School Children (Age 5 to 12 years) from Government and aided Schools - Rs.2.00, School Children from Private Schools (Age 5 to 12 years) - Rs.10.00. Adult : 15.00.